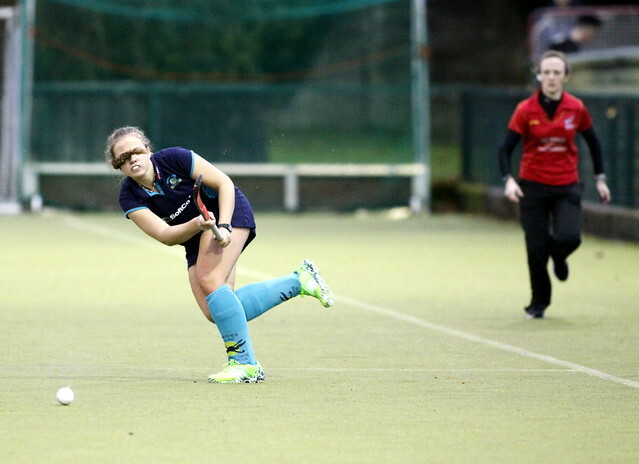 Hermes retained their perfect record at the top of the women’s EY Hockey League in dramatic fashion, winning a feisty top of the table clash with perennial Dublin rivals Railway Union at Park Avenue. All the goals came in a cracking, end-to-end first half, before Railway came within inches of salvaging a draw on the final whistle from a last-ditch penalty corner. It was not to be and Hermes make it five wins from five, keeping their two-point lead over the Ulster Elks in tact with Railway now in third, five points off the pace. Chloe Watkins gave Hermes the dream start with a first minute opening goal from close range. Naomi Carroll then rounded the goalkeeper and shot home for 2-0 with barely five minutes on the clock. Emma Smyth got one back with a corner deflection goal but Anna O’Flanagan – with her ninth goal in the league and 15th in all competitions – restored the two-goal lead by quarter-time from Nikki Evans’ excellent assist for 3-1. Kate McKenna scored the goal of the game with a rocket to the top corner for 3-2 at half-time to give Railway a sniff of a result. The second half was more circumspect but Railway did earn themselves a last minute chance amid a goal-mouth melee. From the final corner, Emer Lucey shot goalward but Emma Gray got down brilliantly to tip it away and record the points. UCD moved up to fifth place ahead of Pembroke as braces from Katie Mullan and Aisling Naughton saw the students earn their second win of the season. It continues Pembroke’s home woes – they have lost all three of their home ties but won both games they have played on the road. Mullan got UCD up and running in the ninth minute when she converted a corner chance with an excellent reverse-stick strike. Naughton doubled the lead 17 minutes in when she picked up the line of a cross from the left wing and diverted into the goal. Stella Davis kept Pembroke just about in the tie with a number of fine saves against her alma mater to limit the damage to 2-0 at half-time. And her side were right back in the mix when another former UCD student, Caroline Hill, found the net from a corner chance. But, in the minute before the three-quarter time whistle, UCD retaliated with quick-fire goals from Naughton and another Mullan effort to race into a 4-1 lead. Elaine Carey copper-fastened the win while Pembroke were down to ten players with Sarah Clarke in the sin-bin before Amy-Kate Trevor got one back late on, her second in as many games. Cork Harlequins struck twice in the second half to win the Cork derby in the women’s EY Hockey League to close the gap on the top three with their third win in succession. In driving wind and rain, the conditions made things difficult at Farmer’s Cross with the majority of play initially confined to the middle third of the pitch. Nicola Kerr and Ailbhe Coyle were to the fore in the UCC defence while Rachael Kohler showed some sublime touches but few chances accrued. With Yvonne O’Byrne pushing on, the home side began to control more of the play in the second quarter but it was UCC who had the best chance with Sarah Browner finding herself unmarked in the circle but she was unable to capitalise. Cliodhna Sargent’s corner shot was well saved low down by UCC goalkeeper Kate Murphy to keep it scoreless at half-time. Harlequins, though, flew out of the blocks after the big break. Olivia Roycroft netted her fourth goal in three games with a rocket of a drag-flick into the roof of the net for 1-0. Her hard-running, in tandem with Miriam Crowley, was causing all sorts of problems, winning a number of penalty corners which Murphy did well to keep out. It kept UCC in the tie and they started to forge their best chances as time went on. Former Quins’ player Antonia McGrath’s deflected shot wreaked havoc with the ball somehow staying out courtesy of Sargent’s diving clearance. With the students committing players forward, the game was sealed for the hosts when Aoibhinn Martin capitalised. Crowley’s reverse-stick shot was well saved by Murphy but it fell to Martin who spun quickly and slotted home for 2-0.
Pegasus recorded their first win of the season with a comfortable 4-0 win over Greenfields whose struggles in the national league continue. The Ulster side went 2-0 ahead insid the first quarter and kept the Galway side at arm’s length from there on. Indeed, the signs were there early on as Pegs won a couple of corners before taking an eighth minute lead. Hannah Grieve worked the ball along the back line to find Suzanne Ferris unmarked at the back post to score. Four minutes later, Pegasus made good use of the slow pitch, drenched in heavy rain, when Ferris caught up with a ball in the corner and found Ruth Maguire free. She, in turn, picked out the unmarked Pamela Glass at the top of the circle and she fired past the goalkeeper. It stayed that way until the third quarter when Pegasus capitalised on sustained pressure. Taite Doherty got the third from close range before Vanessa Surgeoner completed the win when she struck early on the spin to unleash a shot into the bottom corner for 4-0. The Ulster Elks won their fourth match from five outings to stay within two points of leaders Hermes with a composed 2-0 win over Ards in a full-blooded all-Ulster derby, played under torrential rain throughout. The hosts dominated possession initially, winning a couple of penalty corners in the early exchanges before Ards, via good work from Emma Reid, did likewise at the far end but no goals accrued. Jessica McMaster broke the deadlock three minutes before half-time when Shirley McCay’s ball into the circle located the 18-year-old who took a touch before planting the ball into the top of the goal. The Elks pushed on in the second half with McCay and Gemma Frazer powering their efforts. After a trio of corners went unconverted, Megan Frazer extended the advantage in the 42nd minute from a well-worked set-piece that the Irish captain’s backhand shot found the net. Elks continued to press for more goals with Ards counter-attacking when possible but no further goals accrued. The hosts remain second while Ards drop to seventh place after five rounds of matches.